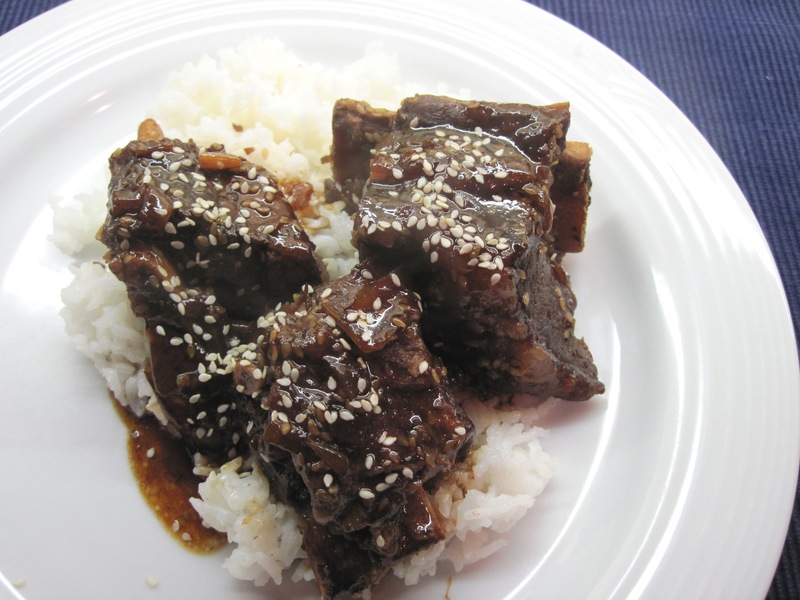 Hawaiian Short Ribs is another favorite from Sunset’s Cooking for Two…or Just for You. In reality, I find this makes enough to easily serve three people. The ribs are not browned before baking, which means no additional fat or oil is required. I like that, since short ribs are, by nature, fatty enough. 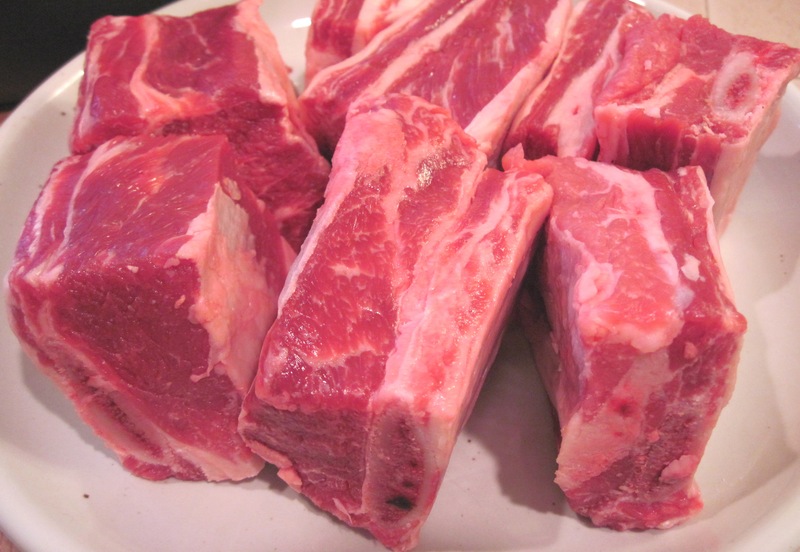 This has to be one of the easiest ways to prepare short ribs. Toast the sesame seeds, slice the onion, combine the sauce ingredients, put everything in a pot and bake for 2 hours. How simple is that? Served with rice and a big salad, it makes a great meal, Hawaiian style. Update 5/8/10: I have not tried it, but this seems like an ideal recipe for a slow cooker. Toast the sesame seeds. Put them and the sliced onions in the slow cooker. Put the ribs on top of the onions. Combine the sauce ingredients and pour over all. Cook on Low for 8-10 hours. Remove ribs from the slow cooker; pour the sauce into a pan. Combine the cornstarch and water and add to the sauce. Cook over medium heat, stirring, until the sauce thickens a bit. 1. Preheat the oven to 400˚. 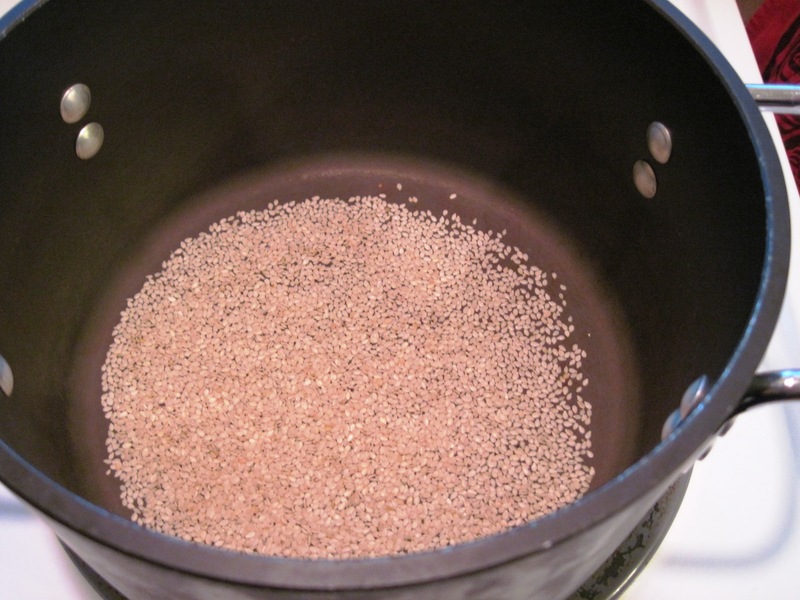 Toast the sesame seeds over medium heat in an oven safe pot. Shake the pan often to toast evenly. Remove the pot from the heat when done. 2. Combine the water, soy sauce, honey, garlic, ginger, Tabasco, and chile flakes. 3. Put the onion slices in the pot with the sesame seeds. Put the short ribs in the pot and pour the sauce over all. 4. Cover and bake for 2 hours. Stir well once or twice during the baking time. 5. Remove meat from the pot and put on an oven safe plate. Cover with foil; put the plate in the oven with the heat now turned off to keep the ribs warm. 7. Combine the cornstarch and water and add to the sauce. Cook over medium heat, stirring, until the sauce thickens a bit. This only takes a few minutes. 8. Serve the meat with cooked rice and some of the sauce. Sprinkle the meat with a few sesame seeds. It’s simple, simple. And tastes great! The meat is really tender after the 2 hour bake. One of our family’s favorite recipes. It works great in the slow cooker, today I’m making it in my tagine since it is too hot to turn on the oven.